Size : 24.2 x 25.3 mm Weight : 13.19 grams. Grade : aF with some roughness, and lightly polished. Obverse : Bust of Galba right, with a star by his chin. The first half of the inscription is off the flan, and the last half is weak but can be read. If the inscription were complete it would have read GALBAC KAICAR AUTOKRATWR CEBACSTOC around. 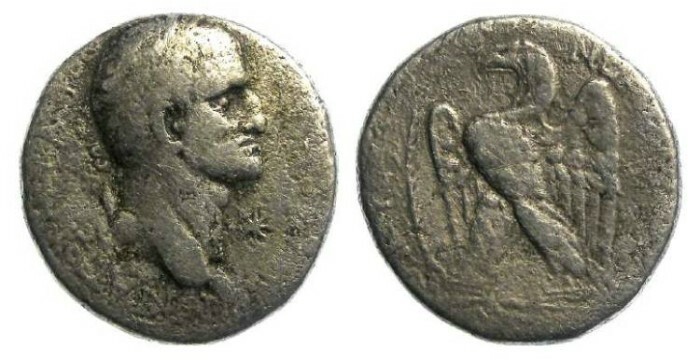 Reverse : Eagle standing left with wings spread, with a palm branch to the left, with ETOUC NEOU IEROUB around. The reverse inscription is fragmentary, but enough can be read to confirm it. Not a pretty coin, but an inexpensive silver portrait of Galba.